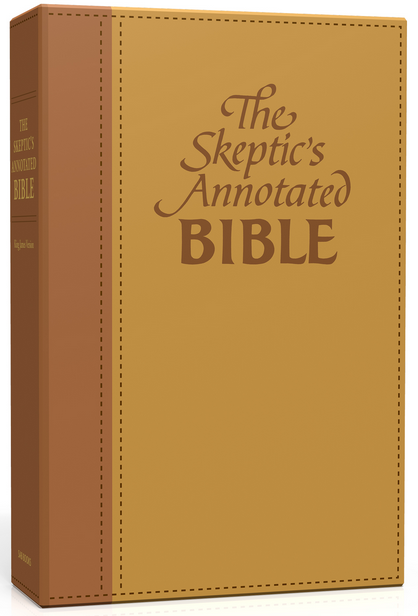 Have you heard of the Skeptic’s Annotated Bible? You really should check it out. It’s an incredible, mind-blowing project by Steven Wells where he went through the entire Bible (both Testaments), the Book of Mormon, and the Koran, and elucidated every single contradiction, inconsistency, bizarre passage, and inhuman verse he could find. Whether you’re a believer or not, it’s an incredible read and a very thorough reference. It was the basis for that beautiful map of the Bible’s contradictions I posted in August. And if you’re not an Internet person, there’s a beautifully-bound print version available for purchase. Oh and Steve Wells tweeted about OMGWTFBIBLE, which is super-flattering! This entry was posted in Announcements, Musings, News and tagged atheism, atheist, bible, christian, christianity, doubt, jew, jewish, koran, mormon, omg, omgwtfbible, reference, skeptic, skeptic's annotated bible, steve wells, tanakh, theism, torah, wtf by omgwtfbible. Bookmark the permalink.